I have been hearing about Copacabana ever since I moved to Södermalm, yet I never made it there. 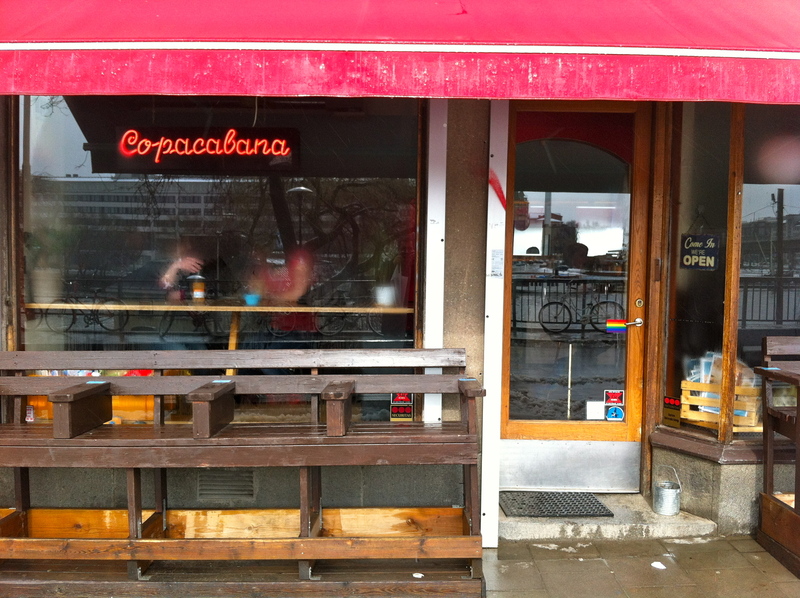 Copacabana is in Södermalm, in the Hornstull area. This is another cool part of Södernalm with a nice cinema, Rio, right next to Copacabana. The famous bar Strand is also right there. Now that I think about it, I should definitely spend more time in that neighborhood. I have been away for a week recently so I fell a little behind on my half marathon training. I was decided to get back on schedule this morning, however it was a bit more difficult than I expected. Indeed, I woke up to a snowstorm!!! Not fun on 14 April. 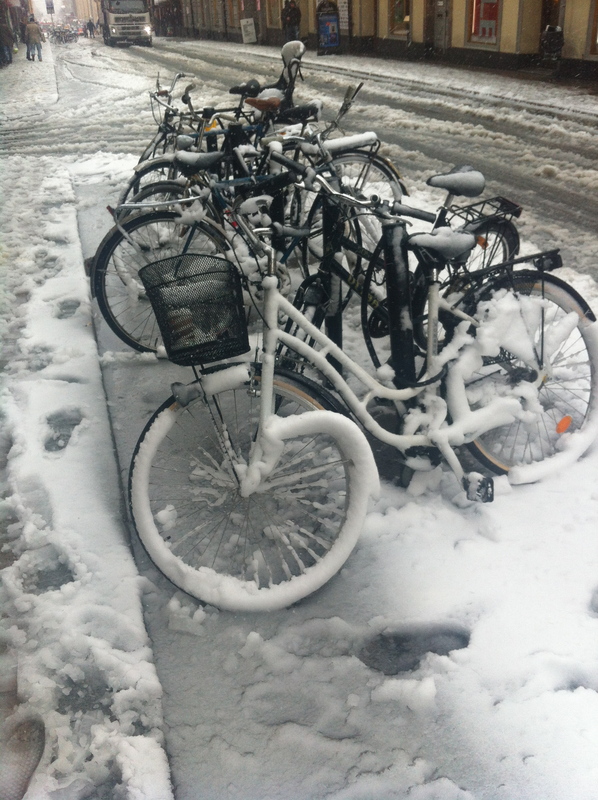 I only did 4k, but I have to admit that it was nice to see Stockholm in the snow again! Obviously, I was not the only one taken by surprise. I am going to a birthday party tonight. 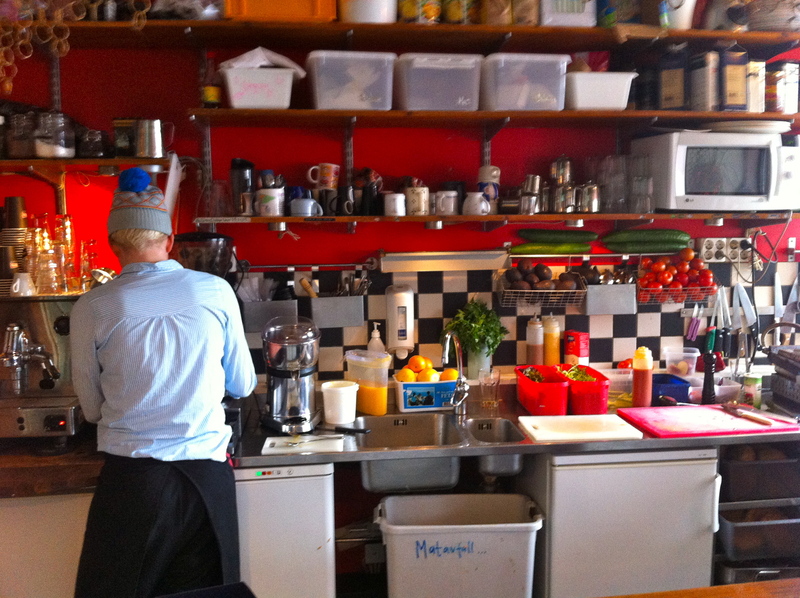 So on my way to get a birthday present, I stopped at a café on Götgatan which does not deserve to appear on this blog. Thankfully I had made plans to meet my friend LSG at Copacabana later in the afternoon. In some respects, my Swedish integration is going better than others. And if there is one area in which I am doing very well is punctuality. I am never late. And like most Swedes I know, I even arrive early to meetings. 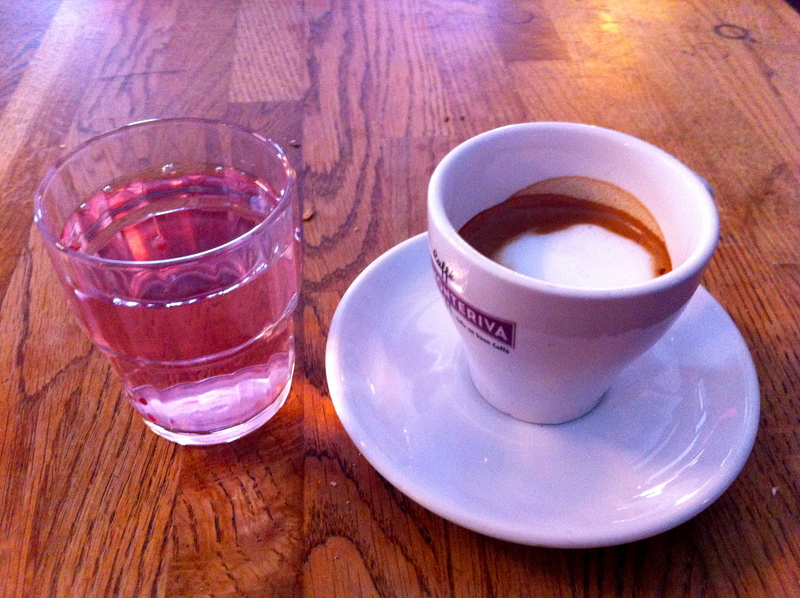 Of course, I got to Copacabana a bit early and had a macchiato with some raspberry-flavoured water while I was waiting for LSG. I vaguely remembered having seen that Copacabana was a gay café. When I arrived there I saw the flag on the door which confirmed that my memory was probably not that off. In fact, I even saw a site that described Copacabana was a “Queer Feminist Café”. Maybe. But when I walked in, Copacabana felt like a nice hetero-friendly gay café. I usually like gay venues. They are usually very cool, located in the best parts of a city, the food and drinks are usually very good. And so is the music. And it is even better when I feel totally welcomed as a hetero man. And this is exactly how it felt at Copacabana. 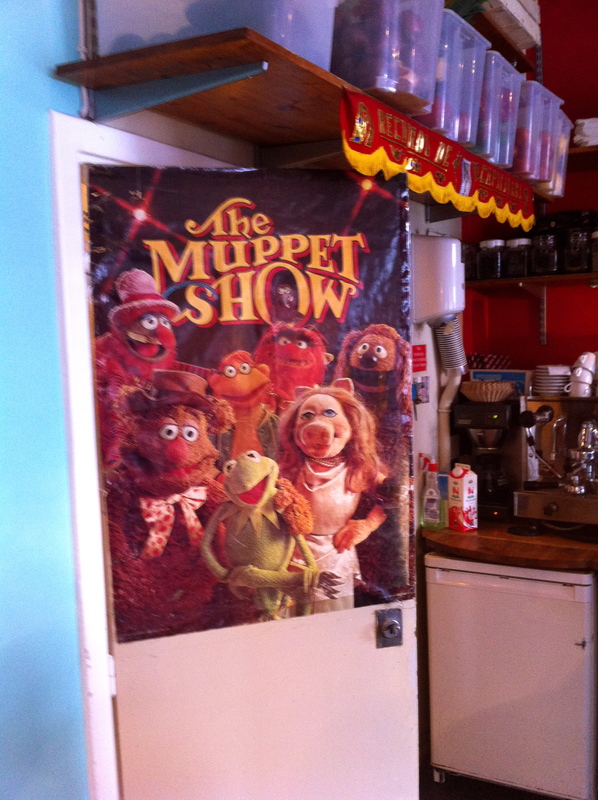 Seriously, if the muppets are there, it has to be cool. Copacabana also has a very nice menu. After the first macchiato, I had a cappuccino with a beautiful carrot cake. Unfortunately, by that time I was heavily engaged in a discussion with LSG and I totally forgot to take a picture! But you can still have a look behind the counter. Coffee is good. Food is nice. Staff is friendly. Customers are fun. The place is cool. And you can go to Cinema Rio straight from the café. Oh, and Copacabana also has wifi. All good reasons to come back. Often! And it is right on the beach at Hornstull. Apparently it is even better in the summer! Thanks Jenny – and welcome back up north! Things are slowly getting back to normal here. Snow is almost all gone today. Now that you are back I should definitely plan a coffee trip to Göteborg! You should 😀 I will gladly meet up!